According to Science and Engineering Indicators 2018, a National Science Board report, there were about 240,000 international students on temporary visas enrolled in science and engineering graduate programs in 2015. This represented 36% of total U.S. graduate enrollment. The proportion of international enrollment was highest — 47% or higher — in computer sciences, engineering (particularly high in electrical engineering), mathematics and statistics, and economics. Any of these students who opted to stay in the U.S. to create a business encountered immigration laws that, absent a start-up visa, make it difficult for them to stay here. This likely created a significant loss for the U.S. economy: in 2013, a report from the Kauffman Foundation estimated that a start-up visa statute could create anywhere from 500,000 to 1.6 million jobs over 10 years. The Global EIR Coalition, a nationwide program that grew out of a local effort at the University of Massachusetts, is working to keep those founders and jobs in the U.S. When attempts failed in 2014 to get Congress to include a start-up visa in immigration reforms, William Brah, assistant vice provost for research and executive director of the UMass Venture Development Center, along with Jeff Bussgang, entrepreneurship professor at Harvard Business School and co-founder of Flybridge Capital, developed the Global Entrepreneur in Residence (EIR) model. This model presented a legal way to help international entrepreneurs stay in the U.S. to start businesses after they graduated. The Global EIR model taps into the visa cap exemption that universities have relied on since 2000, but it uses the exemption for a different purpose — something schools have to adjust to in the program. “Universities are used to hiring just researchers with a certain background using the visa and they may not be used to hiring people with the same qualifications, but instead of doing research they’re doing innovation and entrepreneurship. So, it’s sort of a leap,” Brah says. Global EIRs work part-time for a college or university as a student mentor. Because they are working for a university, they qualify for a standard work visa that is exempt from the visa lottery. When they are not fulfilling their work obligations to the university, they are free to build their businesses. Eventually, these businesses mature to the point where the entrepreneurs are able work for the company they started and obtain a visa sponsored by that company. In just four years the Global EIR program at UMass has hosted 50 international entrepreneurs who’ve gone on to start companies, raising over $416 million in funding and creating about 850 jobs. With the success of the program proven at UMass, Bussgang and Brad Feld, an early-stage investor and entrepreneur, wanted to introduce the Global EIR program to other colleges and universities. They formed a nonprofit entity, the Global EIR Coalition, and expanded nationwide in 2015. The Global EIR Coalition serves in an advisory role for colleges and universities who want to use the model for keeping entrepreneurs in the U.S. When the schools have questions, they reach out to the Global EIR Coalition. Global EIR provides information about the basics of how the program works, free of charge. 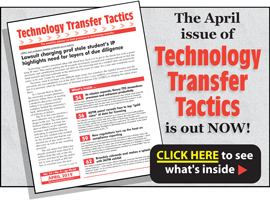 A detailed article on Global EIR programs appears in the January issue of Technology Transfer Tactics. To subscribe and access the full article, as well as the publication’s entire 11-year archive of best practices and success strategies for TTOs, CLICK HERE.